Charles Clark with his work “Officer Justin Terney”. The death of Tecumseh Police Officer Justin Terney in March 2017 in the line of duty shook the communities of Pottawatomie County. In order to give back to those in law enforcement, the Tecumseh Rotary Club’s third annual Arts Festival on July 15 will dedicate revenues from the event to the Fallen Officers Memorial Fund at the Tecumseh P.D. for Officer Terney. Charles Clark, known for his day job as the director of the tribal rolls department at Citizen Potawatomi Nation, is a talented artist with more than 150 paintings to his name. 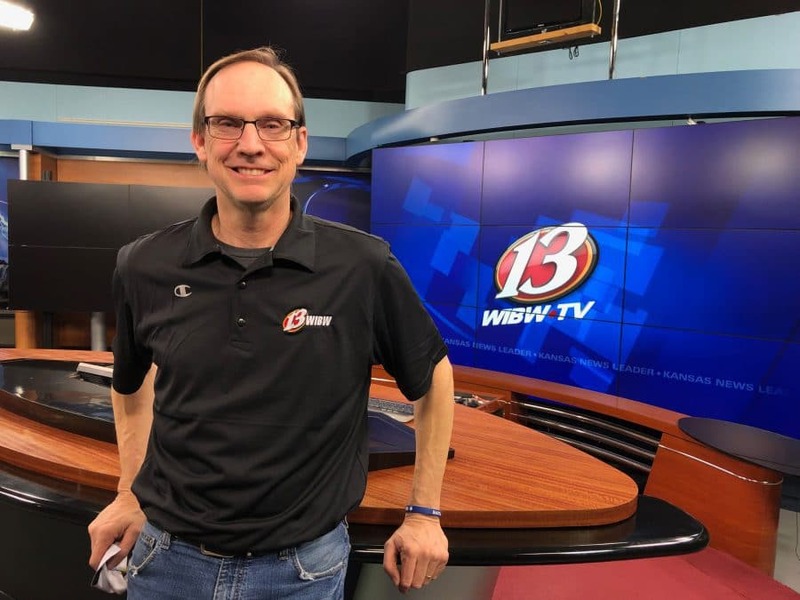 His knowledge and contacts with local artists allowed him to help organize the art show that’ll take place from 2-8 p.m. inside city hall on Saturday. Though his style is more typically geared towards a contemporary, dystopian imagery, Clark’s ability to capture faces and likenesses of subjects made his inclusion at the art show integral. 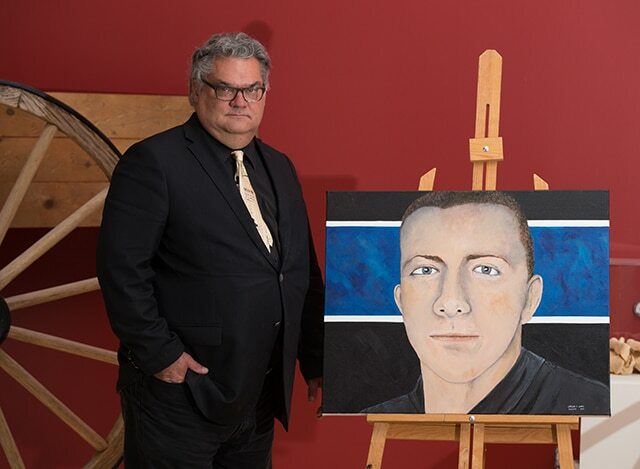 He put his skills to work ahead of the show specifically for the cause of Officer Terney, with Clark donating a portrait of him in uniform for a silent auction that will benefit the police department’s fallen officer fund. Clark will have four additional art pieces on display at the art show. Other local artists including Sara Burk, a well-known photographer and ink drawing artist, will have pieces at the show, Billy Crow, Dean Poole and Walter Rose. Citizen Potawatomi artist painted Goodwin’s likeness from a photo that his family had circulated with the media after his death. Clark donated the portrait free of charge to the family as a keepsake during their time of grief. “It was something that I could do for a family that was experiencing such grief, I initially just wanted to paint it. But I eventually got in touch with Mr. Goodwin’s family and sent it to them,” he said. Downtown Tecumseh will be a busy place over the weekend with the art show at city hall and live music at Farmer’s Daughter Market taking place from 11 a.m. to 5 p.m. Proceeds from the event will go to the Fallen Officer’s Fun for the Tecumseh Police Department.